A delectable merge of two classics. 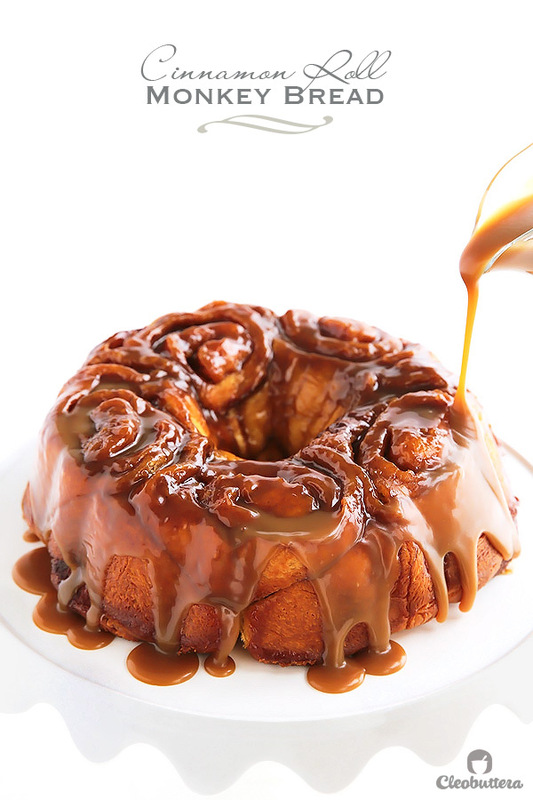 Soft and feathery cinnamon rolls baked in a bed of caramel sauce in a bundt pan, a la monkey bread style, then drenched with even more caramel as it comes out of the oven. Need I say more? Disclaimer: No monkeys were hurt in the making of this beautiful monster. Yes (sigh)…I really had to say this. Having served this mostly to Egyptians, and a few Canadians, I always felt the need to explain myself first, or face the possibility of it staying untouched. Ofcourse there are certain people (THEE best) who dive in without letting a name like this hold them back for a second. My kinda people. YOU GUYS ROCK! I mean…caramel is dripping and cinnamon is wafting…Hello?! Do I really need to justify this? Apparently yes…even a dessert as tempting as this one still manages to raise some eyebrows just by having a funny name. But Reeeeeally though? We have an Egyptian dessert called Zeinab’s fingers. Pota-toe Pota-to. But alas..here I am trying to convince you to eat a warm, soft, cinnamon-y piece of pastry dripping with caramel, just because it has a weird name. Monkey bread is a sweet and gooey pastry served in the United States for breakfast, usually on special occasions and holidays. Its made by drenching lots of very small balls of dough in butter and cinnamon sugar, then arranging them in a bundt pan with or without caramel sauce and baking them off. The result is one amazing bundt-shaped pastry studded with jewels of caramel glistened pieces of dough. The balls of dough get stuck together and are eaten by pulling the pieces apart with fingers, just like a monkey…no offense. But that’s where the name is said to have originated from. Aaaaaahhhh! Needless to say, that once people are enlightened with this piece of information…ATTACK, DEVOUR and DEMOLISH are what unfolds after. 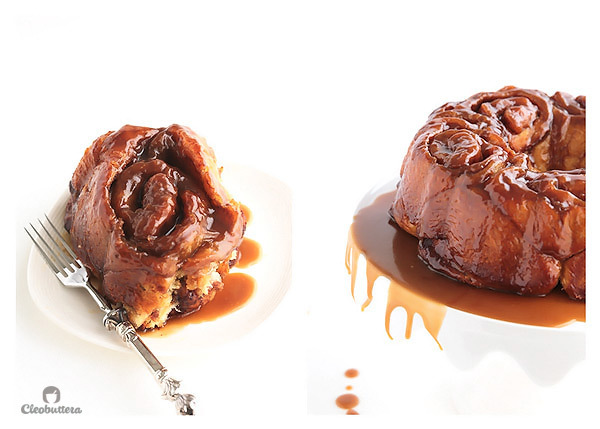 I first made this recipe during my year-long stay in Canada, using Pillsbury Grands ready-made Cinnamon Rolls but made the caramel sauce from scratch. Truth be told, people went banonza over this and never even noticed that it came from a can. It took me literally 5 minutes to put together and was always a showstopper. I’m a strong proponent of baking from scratch…but let’s be real here…sometimes a shortcut is more than welcomed, especially if it tastes that good. Being back in Egypt though, meant no more Pillsbury, so I had to get my act together to come up with a from-scratch solution. I tried 5 different doughs before landing on this discovery from Cooking Classy. This dough is uber soft and feathery and puffy, really just everything you need in a cinnamon roll. Here’s how you do it: (Please note that the detailed recipe in the teal box at the end of the post, will provide further instructions for both the from-scratch and shortcut versions ). Prepare the dough and let it rise as per the recipe below (not pictured). During that time make the caramel sauce and let it cool. 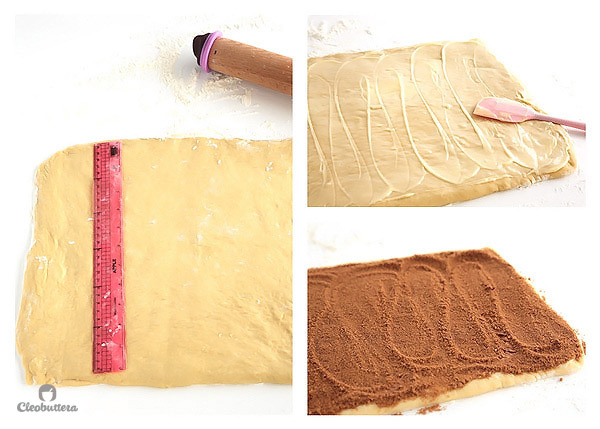 Roll out the risen dough on a lightly floured surface into a 16X12 inch rectangle. Yes please use a ruler. Then you spread some softened butter and sprinkle it with a mixture of brown sugar and cinnamon. 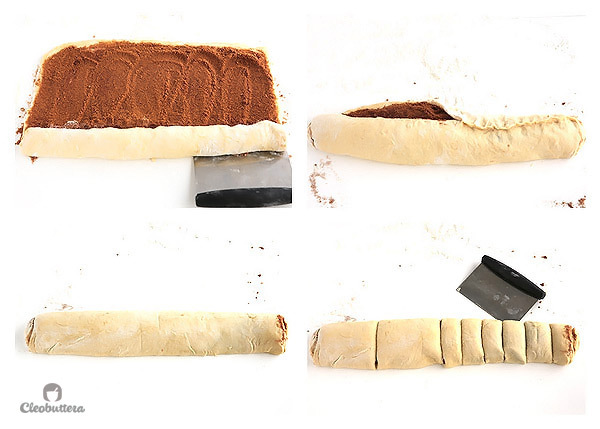 Using a bench scraper or ruler to help, roll the dough snuggly, pinching the seam to the dough, so the cinnamon mixture doesn’t fall out. Then with the seem side facing down, cut the dough into 12 even pieces. 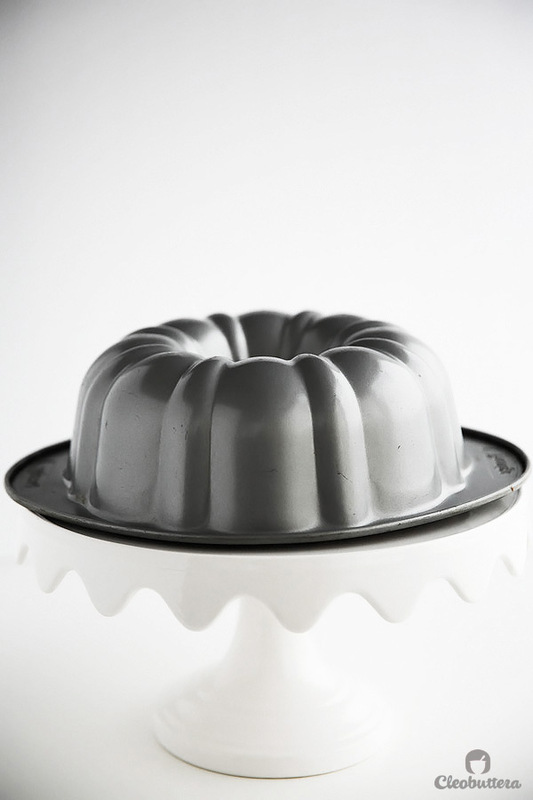 Pour about 1/3 of the prepared and cooled caramel sauce into a buttered non-stick bundt pan. Arrange five cinnamon rolls on top of the caramel layer, then add another tier of cinnamon rolls using the remaining seven. Let that rise again until so puffy, you just wanna cuddle it, about one hour. (If using a ready-made dough, then no need for rising) Then pour another 1/3 of that caramel sauce right over it. Now bake that cinn-ful (ughhh..cheesy pun) pan in a preheated 350F/180C oven until very golden brown about 35-40 minutes. Let it cool for about 5 minutes in the pan while reheating the remaining caramel sauce. Then flip that thing onto your serving platter. Don’t be like me and use a platter with a rim so you don’t make a huge mess. Pour the remaining caramel sauce on top and watch people drool. You know what? If you do that in front of them, you’ll skip the step of having people ask you what it’s called, because with a sight like that…who cares? #Fact: Upon tasting it, several people suggested that I should change its name to “Buns from Heaven,” abort the idea of blogging and open a bakery that only sells this…Yup! It’s that good. In the video below, the Food Dolls, have taken the shortcut route and used Cinnabon’s Pillsbury Grands Cinnamon Rolls, so there’s no rising time involved. WARNING: Excessive drooling may result. A box of tissues nearby is strongly recommended. A delectable merge of two classics. 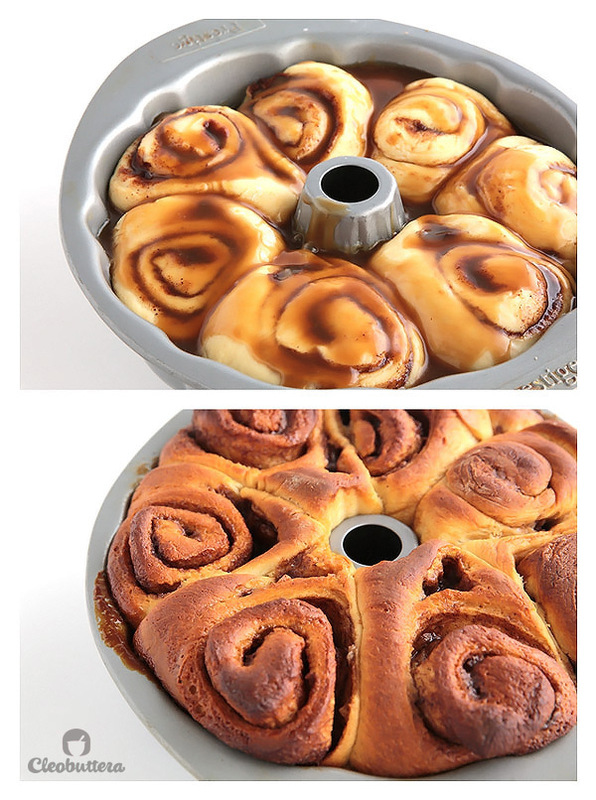 Soft and feathery cinnamon rolls baked in a bed of caramel sauce in a bundt pan, a la monkey bread style, then drenched with more as it comes out of the oven. In a large liquid measuring cup or medium microwave-safe bowl, combine together the milk and 1/4 cup (57g) diced butter. Microwave until the butter is almost melted, about 1 1/2 minutes. Stir in the buttermilk and vegetable oil (this should bring the mixture's temperature down to 105-110 degrees which is warm to the touch, if not then allow to cool down slightly). Pour the milk mixture into the bowl of an electric mixture and whisk in the yeast. Allow the mixture to rest for 5 minutes, then add the granulated sugar, salt, vanilla, egg and egg yolk. Whisk the mixture until well combined. Fit the mixer with the hook attachment, then add 3 1/2 cups (420g) of the flour and knead the mixture on low speed until smooth, about 5 minutes. Dough will be very sticky at that point. Don't worry. Cover the bowl with plastic wrap and allow to rise in a warm place* about 1 1/2 to 2 hours. Meanwhile, make the caramel sauce (recipe below) and set aside to cool. Then in a small bowl, prepare the filling by combining together the 3/4 cup (150g) light brown sugar and cinnamon, cover with plastic wrap and set aside. In another small bowl, combine together 1/4 cup (30g) flour, cornstarch and baking powder. Turn out the dough on a lightly floured working surface and using a rolling pin roll out to a 16X12 inch rectangle. Using the back of a spoon or rubber spatula, spread 1/3 cup (75g) melted butter all over the dough's surface. Sprinkle the brown sugar/cinnamon mixture evenly over the butter, leaving a 1/2 inch on the farthest end to you (the long side) bare. Starting with the 16inch side, that is closest to you, roll the dough up snugly to the opposite side, pinching the bare end with the dough to seal the mixture in. Cut the roll into 12 equal pieces, first by cutting the roll in half, then cutting each half in half, then each quarter in thirds. 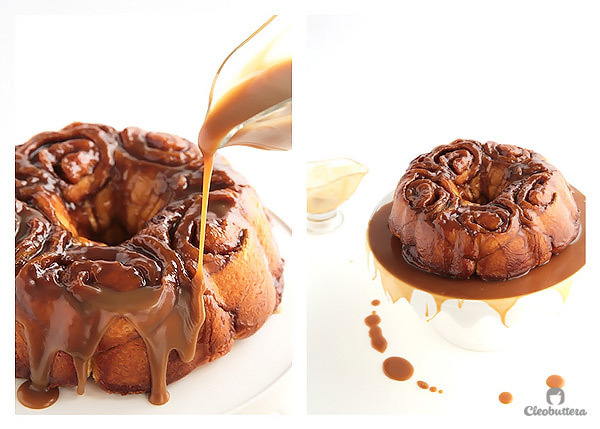 Pour 1/3 of the caramel sauce (about 1 cup) in a buttered bundt pan, then arrange 5 cinnamon rolls on it. Add another tier of rolls on top of then using the remaining 7 cinnamon rolls. Cover with plastic wrap and let rise in a warm place* and until doubled in size, looks so puffy and the rolls stick to each other (about 1 hour). During the last 15 minutes of rising, preheat the oven to 350F/180C. 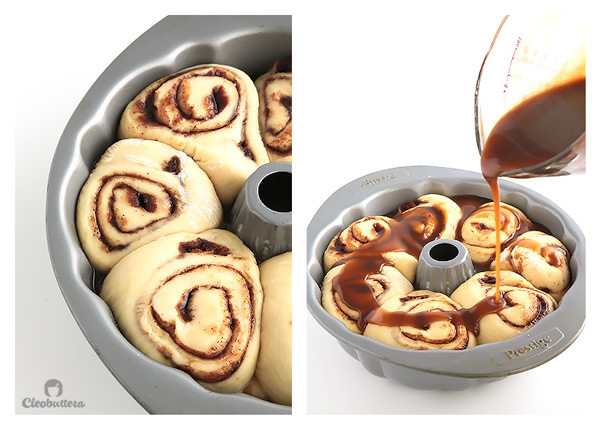 Uncover the pan, pour another third of the caramel sauce (about 1 cup) all over the cinnamon rolls, and bake until the rolls are a deep golden brown, about 35-40 minutes, or until a thermometer registers 180F. Remove the pan from the oven and let rest 5 minutes, then turn onto a rimmed serving platter. Pour the remaining caramel sauce on top and serve warm. Leftovers can be stored in an airtight container for about two days, then reheat individual servings in the microwave until warm. In a saucepan, melt the butter, brown sugar, cream and salt over medium heat, stirring constantly with a whisk or heatproof rubber spatula. Bring to boil and simmer for about 1 minute, stirring constantly. Remove from the heat and let cool before pouring under and over the cinnamon rolls. 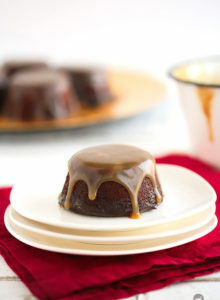 Prepare caramel sauce (recipe above) and pour 1/3 of it into the bottom of a buttered non-stick bundt pan. 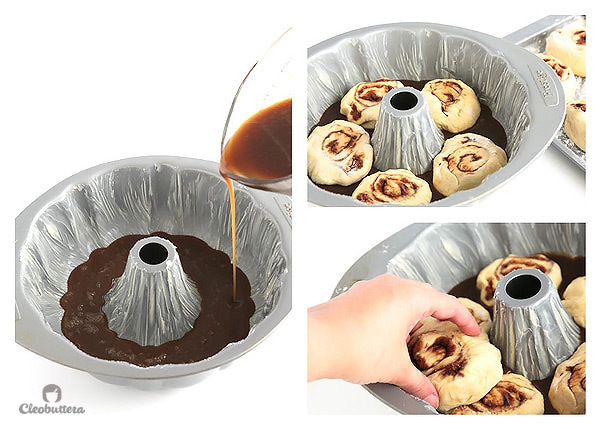 Pop open the cinnamon roll cans and arrange them in two layers. Five at the bottom and five on top. Pour the other third on the caramel sauce on top of the the cinnamon rolls. Bake until deep golden brown, about 35-40 minutes. Take out of the oven and let cool for about 5 minutes. Meanwhile reheat the remaining caramel sauce. Turn onto a rimmed serving platter, pouring the remaining caramel. Serve warm. Leftovers can be stored in an airtight container for about two days and reheat individual servings in the microwave until warm. 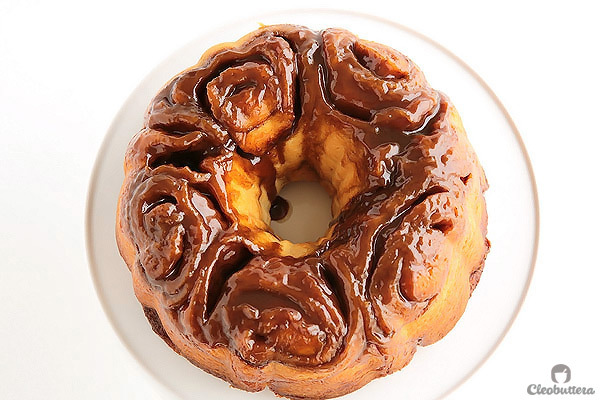 The Cinnamon Roll Monkey Bread could be prepared in advance, up to 16 hours in advance. Just follow directions until step 16, then cover tightly and refrigerate. Take it out of the fridge two hours before baking and let rise like in step 17. Proceed with the recipe. I used Pakmaya instant dry yeast for these rolls, but Venoise is another favorite of mine. The amount of flour varies depending on many factors including humidity and altitude. So if its very sticky slowly add flour more, if needed, until the dough is slightly sticky or tacky. It should stick to a clean finger then pull away without leaving dough behind. It shouldn't be dry either or the rolls will turn out tough. I’ve always been intimidated by making monkey bread, but your recipe and instructions look and sound so simple and straightforward. 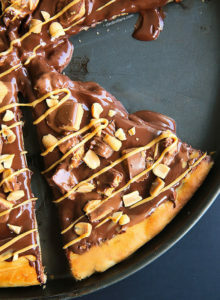 This is definitely a recipe I am no inspired to make! I actually find this easier than making classic monkey bread, because you skip the step of cutting the dough into gazillion pieces as well as the mess that comes with buttering and covering them in sugar. Its definitely a family favorite and I really hope you give it a try some day. Wow, this looks and sounds SO AMAZING!!! Thank you so much. It’s definitely one of our favorite things ever! A BIG warm thank you all the way from Egypt to beautiful Uruguay! Oh please do yourself a favor and give the kitchen another chance. Could just become your best friend:) Thanks for your sweet comment. It might be due to different brands of light brown sugar; I use Dominos. You shouldn’t worry about it if it still tastes good. It should taste like melted toffee. I hope you enjoyed that whole thing though. Shams you’re the first one to report back trying this!!! That’s so exciting for me! I’m always so curious to know how recipes are working out. Soooooo glad you liked it. It’s really one of my favorites. Sure! You can prepare the recipe up until step 15, then cover the pan but instead of letting it rise, refrigerate overnight or up to 16 hours. Then take it out of the fridge 2 hours before you plan to bake it to give it its second rise. If your house is cold and its not rising well, use the trick of the warm oven (mentioned in the NOTES) to help it rise faster. Just make sure you use ‘instant’ yeast and not ‘active’ yeast. Bake as directed. 1. A lot of those who tasted it, for some reason, felt a strong taste of “dates”! I don’t know why ! 4. 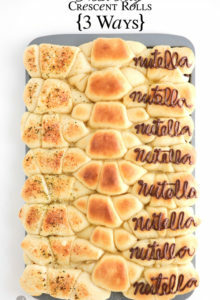 After cutting the rolled dough into 12 rolls, can i just put them in baking tray and serve them as a single serve cinnabons? Hoda!!! So happy you’ve finally conquered your fear of yeast. I used to dreaded by them too, until I discovered that I was using a horrible brand of yeast & also that trick of rising the dough in a warm oven has changed my life. Also instant yeast is my new best friend. Hahaa It’s so weird that they’ve tasted dates. Did u use dominos brand for the brown sugar? I wanted to tell you that your website has encouraged me to start baking and i’ve tried all the recipes on your website and all of them turned out perfectly! I’m so excited to try that one out but I was wondering about one thing I read;why dont we add the cornstarch and baking powder right before we leave it to rise,would it make any difference? Hi Menna! I couldn’t be happier to hear that this little blog has helped you to get baking. I’m even more excited to know that you’ve been having great results. This right here my friend, is enough reason to keep me going. tried this recipe more than once and it always turns out amazingly!!! can’t go wrong with this one.